In order to celebrate and showcase British peoples’ contributions and accomplishments in China, the British Embassy Beijing launches ‘Britons in China’. People will be profiled on the British Embassy website in the year running up to the 2010 Shanghai Expo offering readers an inspiring insight into the lives of notable British people and their endeavours in China. This last three weeks features Helen Couchman as the Expo opens. Photographs of sparkling palaces made of ice in Harbin and news of a country undergoing change at unprecedented speed is what first attracted Helen to China. In 2006, she decided to travel overland on the Trans-Mongolian railway, and after 3 days, Beijing had worked its charm on her. She decided she wanted to move there and has been living and working in the capital since the beginning of 2007. Helen is a British artist based in Beijing. She has exhibited her works worldwide and published her first book, WORKERS 工人, in June 2008. 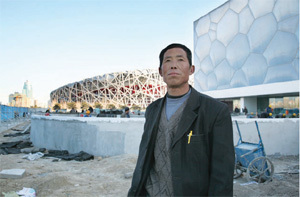 The substantial book, takes the form of an extended series of portraits of the men and women who laboured to build the Birds Nest stadium and Water Cube at the Olympic park constructed for the 2008 Beijing Olympics. Her most recent work is a photographic series titled Untitled (Collecting and Dropping). 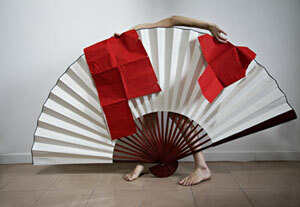 She poses naked behind a large, exquisitely decorated but progressively deteriorating Chinese fan. It encompasses Helen‘s interest in the inevitably esoteric codes of a foreign culture in which one finds oneself still a stranger, an outsider, no matter how long one stays. Helen has visited the Harbin ice festival twice during her time in China. 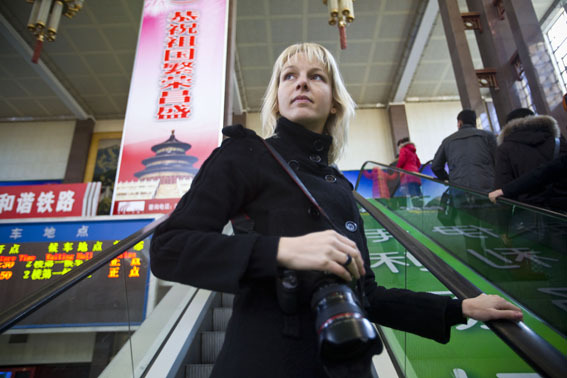 In 2009 she was invited as a guest of the Provincial government to photograph the 25th Anniversary of the Harbin Ice Festival. For the books (and stockists) see: www.soloshowpublishing.com. Or they are available on Amazon.